Watercolour and mixed media paintings. I began drawing and painting as a further interest and assistance to my professional work as a photographer and exhibition display designer and I now paint full time in my garden studio. 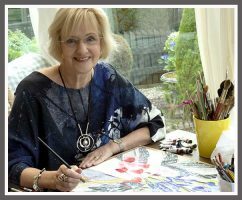 I am an elected Artist Member of the Glasgow Society of Women Artists (GSWA) and the Paisley Art Institute (PAI) and exhibit regularly with them, and in other exhibitions throughout the UK. I Have had solo exhibitions and two international card companies have used my images for their cards. For over 20 years I painted mainly in watercolour, enjoying the unique challenges of the medium, but have begun to gradually incorporate mixed media into my work. I have a very large collection of ceramics and fabrics, many of which find their way into still life or flower paintings. They have become personal ‘friends’ over the years and it’s interesting to use them in different ways, either changing the colours completely or using only parts of the objects. I also enjoy painting landscapes, especially water, hills and the heavy textures of trees and rough foregrounds. As I live on the West Coast of Scotland, I am inspired by the scenery both locally and in the Scottish Highlands, along with the Lake District and Yorkshire Dales. The vigorous marks I use for landscapes make a change from the calm focus of still life painting. I sketch outside, making notes of colours and textures and often bring back stones, leaves and bark, which has fallen from trees, to remind me of the original atmosphere and colours of the scene. I have studied art history for many years and am particularly interested in French and German art of the late 1800s and early 1900s. Henri Matisse, Paul Cezanne, Georges Braque, Ernst Ludwig Kirchner, Franz Marc and August Macke are a few whose work I particularly like and admire. I enjoy travelling and like to visit both British and European galleries and museums to see original works and I am always surprised at the actual size of the work in real life. Reproductions, although a great pleasure to view, can never give the same impression and impact as the originals.